Oils and fats belong to a group of organic compounds known as lipids. Oils and fats are natural occurring esters. Fats are found in animals. Oils are found in both animals and plants. Fats are solids at room temperature while oils are liquids at room temperature. The melting points of fats are higher than the melting points of oils. (– C – C –) covalent bonds. Unsaturated fat molecules are molecules where the fatty acids that contain single (– C – C –) and double ( – C = C – ) covalent bonds between carbon atoms in their hydrocarbon chain. Unsaturated fats can be converted to saturated fats when react with hydrogen gas at temperature 180° in the presence of nickel as catalyst. The reaction is an addition reaction. This process is used in manufacturing margarine. Table below summarise the difference between saturated fat and unsaturated fat. Consist of saturated fatty acids. 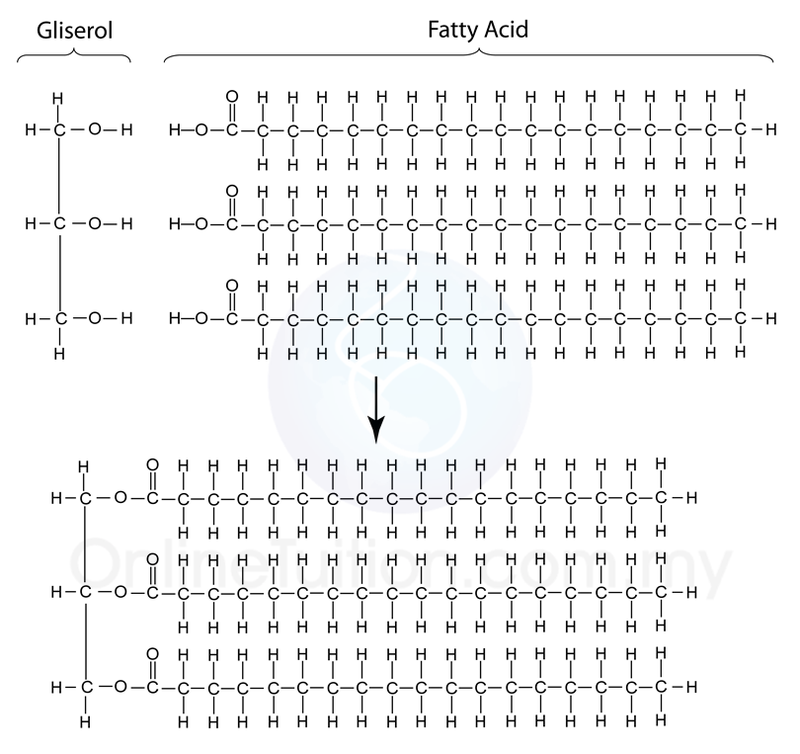 Saturated fatty acids have no double bonds between the carbon atoms of the fatty acid chains. Exist as solid at room temperature. Consist of unsaturated fatty acids, which contain one or more than one double bond in the fatty acid chains. Exist as liquid at room temperature. 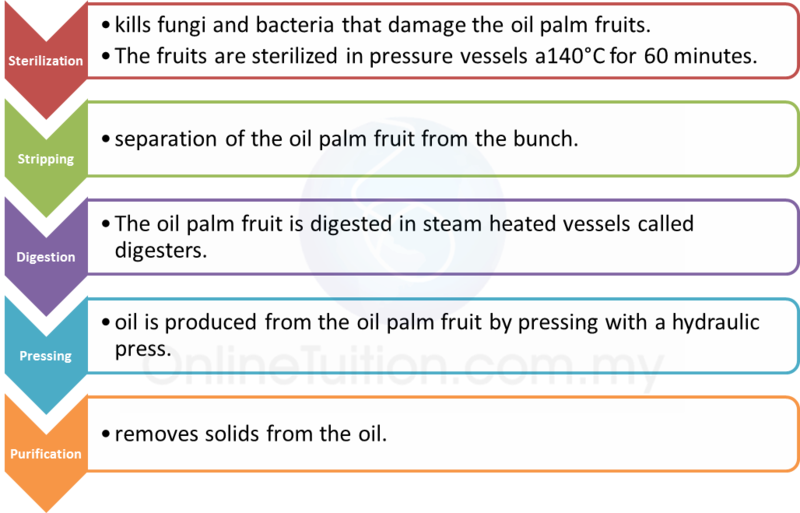 The advantages of using palm oil are as follows. Natural rubber is a natural polymer. Latex is a milk like liquid that flows out after the bark of the rubber tree is cut. Latex is mixture of rubber particles and water. 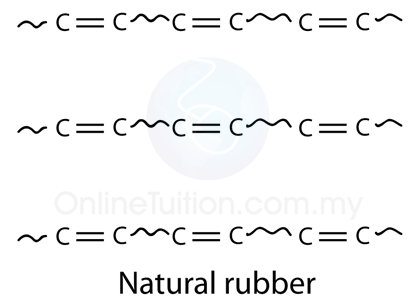 Formula of natural rubber is (C5H8)n, where n is about 10,000. Monomer of natural rubber is C5H8, known as 2-metylbut-1,3-diene (isoprene). 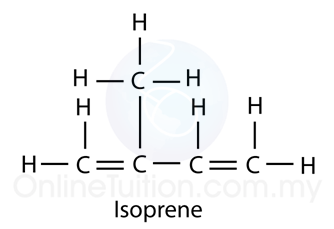 Each monomer molecule has 2 double bond and thus known as -diene. Each rubber particle consists of rubber molecules which are enveloped by protein membrane. Protein membranes are negatively charged on its outer surface. Like charges repel. The repelling force exists between the rubber particles which cause the particles to be separated from one another. This prevents the bonding of rubber particles and thus prevents coagulation of latex. acid such as ethanoic acid is added to it. When acid is added to latex, the hydrogen ions from the acid neutralise the negative charges on the surface of the protein membrane. The neutral particles no longer repel each other. These rubber particles may collide with each other, causing the membrane to break. The rubber polymers are freed and they coagulate by combining together to form large lump of rubber polymer. The latex has coagulated. the latex is left aside for 1 – 2 days. This is due to bacterial action on latex. The activity of bacteria in the latex produces lactic that contains hydrogen ions which causes coagulation of latex. Coagulation of latex can be prevented by adding alkali to it. The OH– ions from the alkali will neutralise any acids that may be produced by the bacteria. Natural rubber is vulcanized to improve its characteristics so that its usage could be wider. 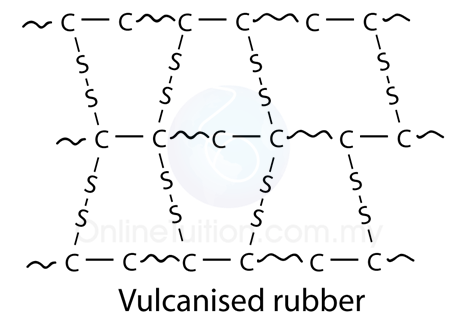 Vulcanised rubber is rubber that has been heated with sulphur. Vulcanised rubber is prepared in the laboratory by soaking the rubber in a solution of disulphur dichloride or sulphur monochloride in methylbenzene. Rubber molecules have double covalent bonds. Sulphur atoms react with the double bond in the rubber molecules chain to form C-S-S-C cross link between the rubber molecules.